When we started this blog, my idea was to do a summary post every week or so, covering what happened, where we went, what we did, and what we saw. If you look over the past posts, you can easily see that it hasn’t happened that way. It’s can be daunting to pull everything together for a long post, which makes it really easy to put off for a day or two (which turns into weeks or even months). I’ve been reading Nick’s Blog (Gypsy Journal) for two years now. He posts every. single. day. To the point that if he doesn’t post, people worry that something happened to him or his wife, Miss Terry. His dedication and reliability are inspiring. Inspiring to the point that I’m going to try to emulate him (highest form of flattery!) and try to post every. single. day. Last night we were in Kirby, Arkansas, staying at Kirby Landing by the lake. Very nice but hotter than heck and way, way, WAY too humid for me. Our reservation was up, so we left this morning. We managed to get everything cleaned up, put away and secured to be on our way by just after 9am. A sort of record for us. We headed off towards Hot Springs. One of our rules is to try not to go the same way twice. A couple of days ago we drove into Hot Springs to meet up with Charlene Simon of Bathhouse Soapery and Caldarium; on that trip, we took Highway 70. So this morning we went on different backroads (Hwy 84 to Hwy 128). It was a little longer, but we got to see some new things. In Hot Springs (where it was about 85 degrees with a “Real Feel” of about 100 degrees along with about 70% humidity), we went to the Hot Springs National Park Visitor’s Center. 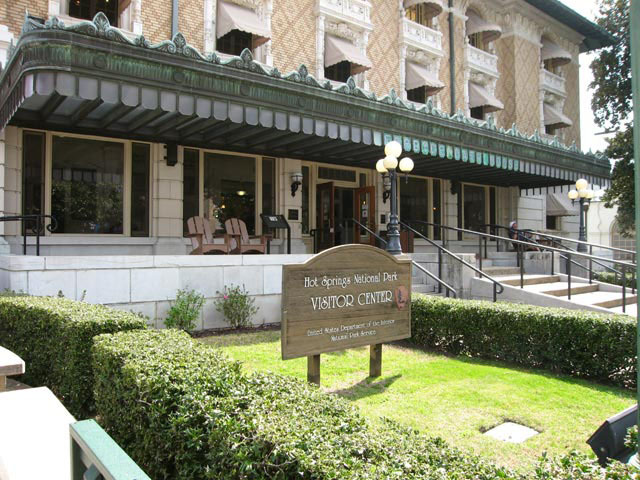 The tour of Fordyce Bathhouse was very interesting, and I got my National Parks passport stamped. From there, we headed out of town, east on Hwy 70, and onto Highway 30 to Little Rock. It wasn’t nearly as far as I thought it would be. 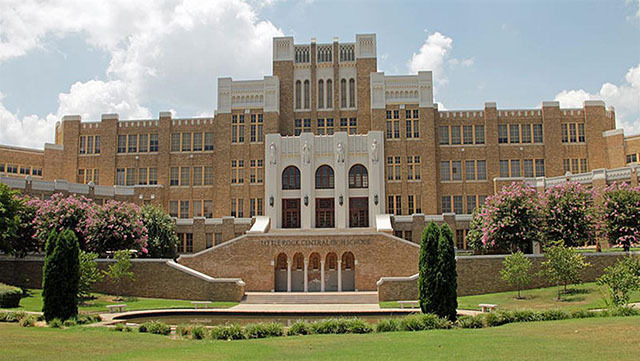 In downtown Little Rock we went to the Little Rock Central High School National Historic Site. We weren’t able to tour the high school itself, but we did visit the Visitor’s Center … and I got another stamp in my National Parks passport. 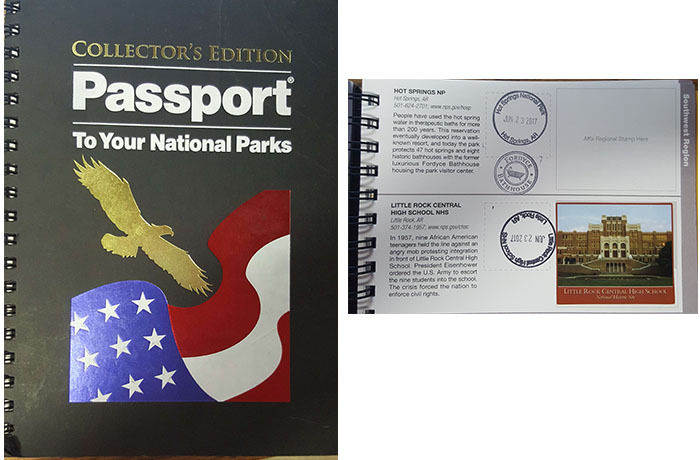 I like seeing the National Parks and getting stamps in my Passport! After Little Rock, we continued east mostly on Highway 70, which parallels Interstate 40. It was hot, humid and extremely uncomfortable. Even with the generator running and the air conditioner on, it was nearly as hot inside the bus as it was outside. Actually, we found that opening the windows was actually more comfortable. The bus, however, didn’t like the heat. We got an “Engine Hot” light and warning, and had to pull over. Looked like a leaky hose because the water level was way down. We were in the parking lot of a farmer’s coop, so we asked for advice for a diesel mechanic. At 4:30 on Friday – good luck, we thought! Turns out, they recommended a place not too far down the road, behind the Dollar General. We got there in about 10 minutes, and Keith came right out to take a look. He spotted the problem immediately, got a crescent wrench and we were set! It was simply a loose fitting on the drain faucet for the cooling system. He didn’t even charge us, although we did pay for the anti-freeze that went in the water needed to fill it up. We were on our way in 15 minutes, tops. Tommorow we’re heading to Graceland! It’s fun reading about your adventures!